Come and experience for yourself how the WNY Flash Academy and the ECNL are changing the landscape for youth soccer players in Western New York. The WNY Flash Academy is gearing up for our inaugural season in the Boys ECNL in 2018/19, beginning with some Free ID Clinics for boys to be evaluated on April 13th and April 20th. Please click here for more info and to register. Additionally, we will host a WNY Flash and ECNL Town Hall on May 6th at the Millennium Hotel in Buffalo. Please register to attend here. Having quickly built the strongest girls program in New York State, we are committed to replicating these experiences and opportunities on the boys side. In addition to our training philosophy, methodology and environment, we train out of top rated facilities and have a professional coaching staff. Our college placement program stands alone in WNY and we are excited to add the final critical component; the ECNL playing and college exposure platform. The Boys ECNL is set to be a game changer for boys soccer in WNY, especially for Buffalo based players who previously had to travel to Rochester to play at a National League level. The ECNL is a proven platform designed to develop players and maximize opportunities for college placement. Players playing in the Boys ECNL are also eligible to play on their high school teams. 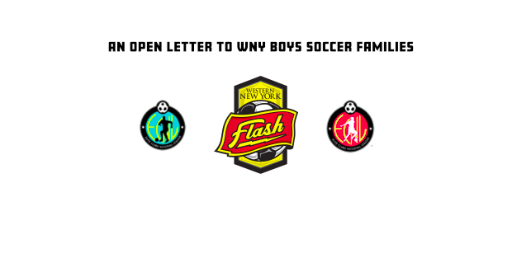 We are excited at the interest in the WNY Flash Boys ECNL program among the areas top players. Forming teams is an ongoing process that will be wrapped up at tryouts. Generally speaking the vast majority of player evaluation is done prior to the tryout itself, for both boys and girls teams. We will be announcing our Boys Director, ECNL Conference alignment, and coaching assignments for next years teams soon.